Airship Ventures: Texas by Airship. Matthew Kilkerr, our Technical Manager, is relocating to CA from FL. One item he has to relocate is his Cessna. So he's flying the transit. It's great having your chief engineer at the airport as you take off and having him at the next airport when you land! Matthew sent me these pictures this morning. Wow. 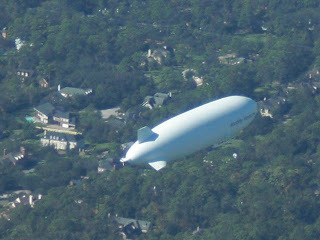 I like the airship over the Texas McMansions. Super congrats, Alex. Speaking as someone who once lent you a straw hat when you were a mere whippersnapper half your age (ish!) it’s a real buzz to see you leading such a happy and thrilling life adventure. Stay in the blue, and stay safe. The only straw hat loaning Peter I recall was a postman with a fondness for analog audio. Do you need a doctor on this trip? Heh, am long post post; now working in your second recollection. It's good, but not as brag worthy as your escapades (you git ;-)). pfulford@dircon.co.uk if you want to natter sometime.